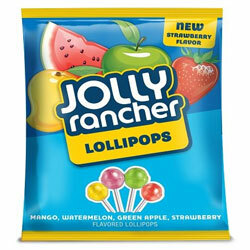 Order Tasty Jolly Rancher Lollypop Online. Send this gift pack of 4 different flavours of lip licking lollypops. Flavours like Strawberry, Mango, Watermelon & Green Apple is sure to tick the taste buds of your loved ones on this special day of their life.